Duinweg 131 is a beautiful downstairs apartment with private terrace and garden, uniquely situated at the foot of the dunes in the beautiful holiday park Duinweg in Westkapelle and with lots of privacy. 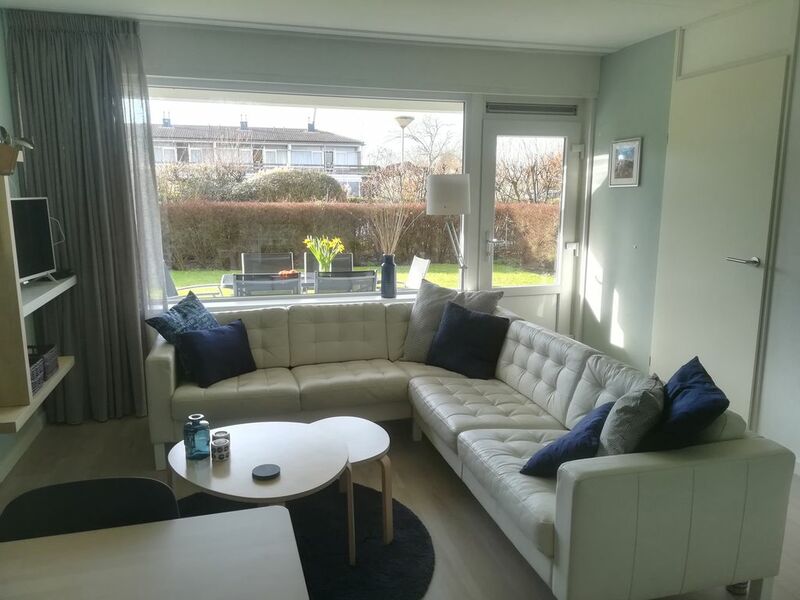 The apartment is a stone's throw away from the sea, the beach and the dunes and was completely renovated at the end of 2017-early 2018, almost completely renewed and equipped with new furniture. In the living room is the dining area, a sitting area with fireplace and TV, on which Dutch and German channels can be received. The apartment has a bathroom with shower, WC (hanging toilet), washbasin (bathroom furniture) and washing machine. The apartment is equipped with a kitchen with oven-microwave, stove with hood, dishwasher and fridge with freezer. A complete kitchen inventory with coffee maker, kettle and toaster is available. The master bedroom has 2 box spring beds of 200 x 80 and 2 smaller bedrooms. One bedroom has 2 beds (200 x 90), one bunk bed with a sturdy staircase. The other bedroom has 1 bed (200 x 90). In both (children's) bedrooms there is (possibly) space for placing a pushchair, buggy and / or adding a baby cot. The entire apartment is equipped with a new CV, so that the stay is also very pleasant at lower outdoor temperatures. The terrace is equipped with a garden set with 4 chairs and a solar parasol. A parking space is available at the apartment. Besides the sea, the beach and the dunes, the area offers many walking and cycling routes and attractions. The park has a paddling pool and an adult pool (freely accessible for park guests) and there is also a tennis court and children's playground. Pets are not allowed in the apartment and smoking is forbidden. In high season, arrival and departure is only possible on Saturdays. Outside the high season, arrival and departure are possible from Monday to Saturday. Arrival on Sunday only in consultation. Arrival is possible from 16.00 hours. Departure no later than 10.00. Booking for a midweek, 4 nights, (period from Monday to Friday) is also possible. Tourist tax: € 1.30 p. p.p. n.
Erholsam, ruhig und alles bestens. Es waren angenehme und erholsame Tage im Duinweg 131. Nur die Bedienung des Backofens ist etwas kompliziert. Es fehlte die Bedienungsanleitung. Gut, dass Sie das sagen. Kurzfristig wird die Bedienungsanleitung in der Wohnung platziert. There are numerous attractions, museums and other attractions nearby.